MoDOT Headquarters and Missouri State Capitol. No other major department of state government has closer proximity to the General Assembly. Summary:  The penny sales tax is back. A sales tax for highways is a bad idea. If something more reasonable is to even be considered by the General Assembly, it’s up to leaders in Missouri’s urban areas to make it happen. That penny sales tax for transportation — the one that was defeated in the closing hours of the legislative session last spring — is back. Rep. Dave Hinson filed House Joint Resolution (HJR) 68 in the House on January 22, and Sen. Mike Kehoe is expected to file a corresponding and presumably identical measure in the Senate during the coming week. A summary of the bill has not yet been posted. Support for it is already being garnered. After all, if the mostly-highway-lobby sponsors of the tax proposal can it put on the ballot by the legislature, they can avoid the $1-2 million estimated cost of circulating an initiative petition. 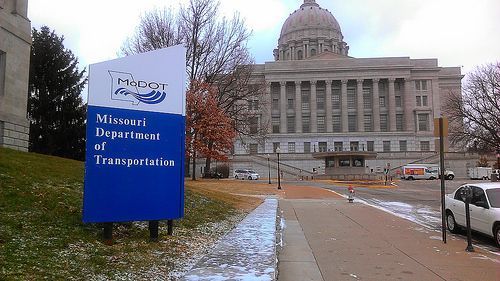 On January 23 the Missouri Chamber of Commerce, along with the Farm Bureau, State Highway Patrol, and MoDOT, held their annual transportation conference. MoDOT’s Chief Engineer Ed Hassinger spoke about the new long-range plan, Vision for Missouri’s Transportation Future. He was followed by Representatives Hinson and Schatz and Senator Kehoe. MoDOT’s Director, Dave Nichols, was the luncheon speaker. By all of the accounts we’ve seen — tweets during the conference and subsequent news reports — the discussion was all roads and bridges. That shouldn’t surprise anybody, given that it was the Missouri Chamber and Farm Bureau whose support was being sought. We suspect transit and other modes were at least mentioned — in response to a tweet from Tom Shrout of St. Louis, MoDOT Director Nichols gave assurance that he would speak about all modes — but in effect it was all about roads and bridges. The message was dire: If MoDOT doesn’t get additional funding pretty soon, it will barely be able to maintain Missouri’s 33,000 miles of roads in good condition. Whats more, within just a few years MoDOT won’t even be able to afford the matching money needed to get the federal funds expected to be available to Missouri. Presentations at the conference were undoubtedly oriented to support what is widely anticipated to be the likely funding solution — a one penny increase in the state sales tax. We know MoDOT people well enough to believe they’d probably rather get the new money from some other source. After all, they know the sales tax doesn’t do anything to recover from highway users the full cost of building and operating roads and bridges. They know that the sales tax hike gives the trucking industry a free ride, since there’d be virtually no increase in revenue from trucking, even though trucks put an undue burden on roads and bridges, and cause MoDOT to have to build them to carry heavier loads. MoDOT is in the unenviable position of wanting to maintain our roads in good condition, and to expand capacity where it might be needed, yet having virtually no say in where the money comes from. But on the other hand, wouldn’t it make sense for MoDOT to at least make a case for some other revenue enhancing scenarios — even if those scenarios don’t have much chance of success in the current political climate in the Legislature? After all, one can’t expect to get support for something unless somebody has at least made a good case for it. Past efforts by MoDOT to get other sources of funding considered have been largely a matter of “testing the political wind,” rather than laying out a “here’s what really makes sense” proposal. The January 23 conference wasn’t about how best to raise the money. Instead, it was about building support for the sales tax. Period. It didn’t matter that the sales tax is regressive, and that it has met resistance from many quarters, including local public officials across the state. We know, for example, that elected officials in the Kansas City area are notably cool to the idea. After all, there are local needs that involve putting sales tax measures on the ballot. Think expansion of the Kansas City Streetcar System. Think Jackson County’s Trails and Transit Plan. And it certainly didn’t matter that trucks would get off scot free. We recognize, by the way, that a small sales tax might be necessary to provide additional state funding for urban and rural public transit, inter-city passenger rail, and other non-highway modes. A sales tax of two-tenths of a cent would be more than adequate for those needs. In his State of the State message on January 21, Governor Jay Nixon called for “robust discussion” of our transportation needs and how to fund them. A robust discussion can’t be expected to occur at a Missouri Chamber / Farm Bureau conference that was designed to build support for a penny sales tax. If anything, that conference probably served to heighten the division between Missouri’s rural and urban interests. If we are to see anything resembling the robust discussion that Governor Nixon called for, it’s going to have to be sparked by urban leaders. We suggest that Mayors James (Kansas City) and Slay (St. Louis), county chiefs Sanders (Jackson) and Dooley (St. Louis), MPO directors Warm (Mid-America Regional Council) and Hillhouse (East-West Gateway Council of Governments), civic leaders — plus the Governor himself — come together and have that robust discussion. We’d expect the outcome to be a far more reasonable and equitable solution for funding Missouri’s transportation needs than a simplistic penny increase in the sales tax.